Baking soda and washing soda sound like they are the same product. Although both are commonly used as affordable and environment-friendly household cleaning products, it is important to know that they are completely different and that each has its own unique purpose. 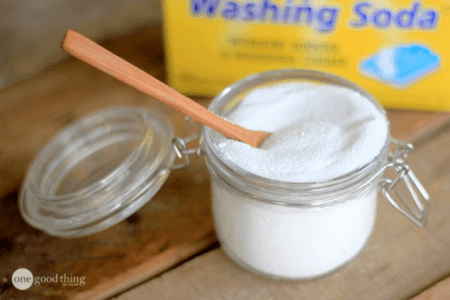 This post will discuss the uses of and difference between washing soda and baking soda. Washing soda is Na2CO3, or Sodium Carbonate. It is naturally derived from the ashes of plants that are grown in sodium-rich soils but can also be synthetically made from limestone and salt through the Ammonia-soda or Solvay process. It is also called “soda ash” in some areas. Washing soda is a white coarse odorless powder with a pH level of 11. It should not be consumed, inhaled, or applied to the skin because it is abrasive. When handling the product, it is best to wear gloves. As the name suggests, the chief purpose of washing soda is for cleaning or washing. Aside from being used to wash clothes, it can be used to clean bathtubs, bathroom sinks, floor tiles and stubborn stains like grease and wine. However, it is caustic so it may damage some surfaces. When not rinsed well, it may leave white marks on the surface as it does not quickly dissolve in water. Because washing soda reacts with calcium and magnesium bonds, it is also widely used as a water softener. Additionally, it is also a component in glass-making and is used in neutralizing the chlorine in swimming pools. On the other hand, baking soda is Sodium Bicarbonate or NaHCO3. It can be collected from a natural mineral called “nahcolite” but can also be artificially produced by the Solvay process. It is a water-soluble white fine powder with a pH level of 8.1. Baking soda, sometimes called “bicarbonate of soda” or “cooking soda,” is an edible base. It is used not only in cooking and baking, but also as an ingredient in homemade personal hygiene solutions like mouthwash, a toothpaste and facial exfoliator, and as a cleaning agent. It is widely used to clean and disinfect ovens, carpets, countertops, chopping boards and sinks. It is gentle and does not damage surfaces. Additionally, baking soda quickly dissolves in water and does not leave white residue on surfaces. Although it is gentle enough to be ingested, it should not be inhaled or applied around or to the eyes. 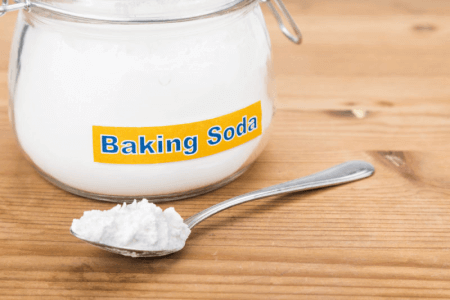 What, then, is the difference between washing soda and baking soda? Washing soda is Na2CO3 or Sodium Carbonate while baking soda is Sodium Bicarbonate or NaHCO3. Both can be synthetically produced by the Solvay process. However, washing soda can be naturally derived from plant ashes, while baking soda can be collected from nahcolite, a naturally occurring mineral. Baking soda has a lower pH level than washing soda. It is also edible, can be applied to human skin and can clean most surfaces without causing damage. Washing soda is caustic and should not be consumed, inhaled or applied to the skin. In terms of texture, baking soda is white and fine while washing soda is coarse. Additionally, baking soda is water-soluble and does not leave white residues on the surface, unlike washing soda.